Come home to the most unique Atlanta apartments at Camden Paces. Experience three unique living choices with one, two or three bedroom apartments or townhomes in one distinct community. Our floor plans feature some of the largest square footage in the area so our apartment homes are a natural fit for anyone transitioning to or from a single family home. Our pedestrian-friendly Buckhead neighborhood gives you many options in this live, work, play community. High-end shopping, renowned restaurants, and unparalleled nightlife right outside your door. From the Shops of Buckhead, organic groceries, great restaurants and nightlife, many boutiques, golf courses and parks are just minutes away. Top schools such as Atlanta International School and The Westminster Schools are also close by. 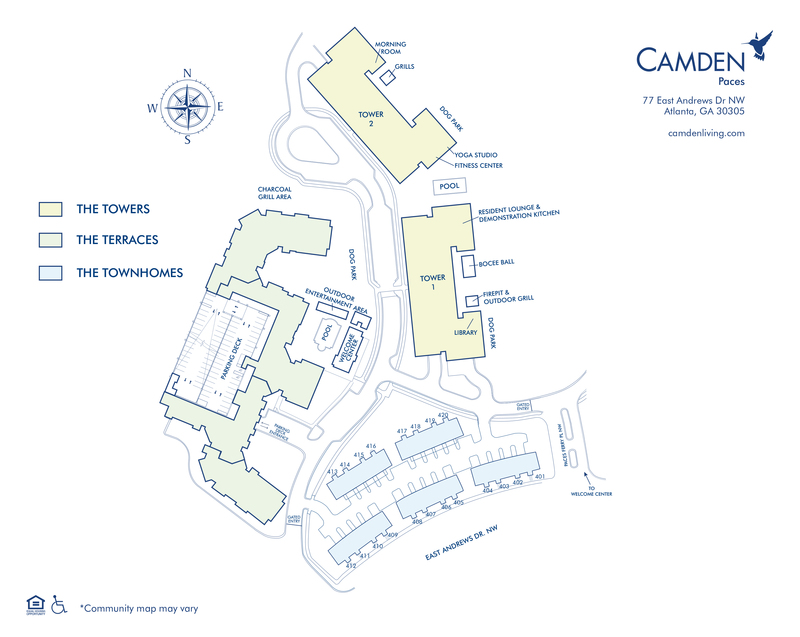 The Terraces, The Towers and The Townhomes at Camden Paces offer custom home interior features and incredible amenities. The interior features vary per building; however, all apartments feature a full-size front load washer and dryer, stainless steel appliances, quartz countertops, crown molding and baseboard detailing large walk-in closets, and a private patio or balcony in an access controlled building. The Terraces feature a bottom freezer refrigerator, track lighting, lighted ceiling fans, and USB electrical outlet in the kitchen. The Towers feature a French door refrigerator, gas stove, contrasting kitchen cabinetry, kitchen island, hand scraped hardwood floors, walk-in shower with glass enclosure, large soaking tub, and wrap around private patio or balconies. The Townhomes feature three levels with over 2,000 square feet of living space, attached garage, private entrances and street access, gas fireplace, custom built-in shelving, crown molding, and coffered ceiling. Enjoy relaxing outdoor retreats in the cabanas that surround our saltwater swimming pools or sip some coffee and read the paper in the morning room or library. Get work done in a quiet place with high-speed internet inside the e-Lounge. Let your dog play in our dog parks and spiff them up at the pet spa grooming station. Play a game of bocce ball with some friends, have a cookout by the fire pit, or get in a full body workout in the fitness center or at any of our cross training or yoga studios. Residents receive a technology package included in the total monthly rent with a savings of up to 53% off retail. This money-saving package includes high-speed internet and over 300 digital video channels including HD channels through AT&T U-verse U200. Use the AT&T U-verse app on your smartphone or tablet to access your digital video anywhere! Plus, each package includes a DVR and all apartments are fully equipped for WiFi. Whether you are enjoying your apartment, taking advantage of the amenities, or loving the location, you will experience living, shopping, playing and relaxing at your own pace when you live at Camden Paces. We'll save a spot for you! Townhomes include an attached, two car garage. In all other buildings, we offer one parking space per lease holder at $50 per month. Additional spaces are available for $100 per month.